We supply a range of high quality inventory labels for marking your equipment. 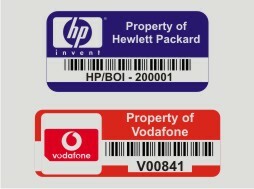 These labels are commonly used in many organisations for a wide range of applications, from IT equipment, office furniture and heavy-duty machinery. We can manufacture your labels with your company's name printed, serial number and logo at no extra cost. Our labels normally come supplied on rolls, apart from our anodised aluminum tags, which are supplied in convenient strips of 10 to 13, depending on the specification. We can manufacture inventory labels in virtually any size, shape and colour, at affordable prices. Affixing a high quality label to your assets, can help you manage your equipment more efficiently, thus enabling you to keep an accurate record of your inventory.